Make Money Online Resources Should You Start Newsjacking on Your Website or Blog? Should You Start Newsjacking on Your Website or Blog? Newsjacking may be a good solution for you if you are trying to generate traffic and/or sales on your website or blog, or get some attention on your products -or even yourself. This latest PR strategy can work wonders if used correctly- but there are risks too. Newsjacking is a term coined by David Meerman Scott and refers to the practice of adding your own spin to breaking news in order to siphon some of the search and social media traffic to yourself and/or your business. This spinning usually includes creating original content and publishing it on your blog or website and/or posting content or links on social media, especially news-centric social media platforms like Facebook and Twitter. In essence, you “ride” the SEO wave around a popular news topic and try to get some of that wave to wash back to your own web or blog pages. When executed correctly, newsjacking can even attract the news media itself, who either mention you online or backlink to your content. Such media mentions improve your SEO long-term, and not just during the newsworthy moment. This tweet, sent out during the 34-minute Super Bowl blackout, was retweeted over 15,000 times. 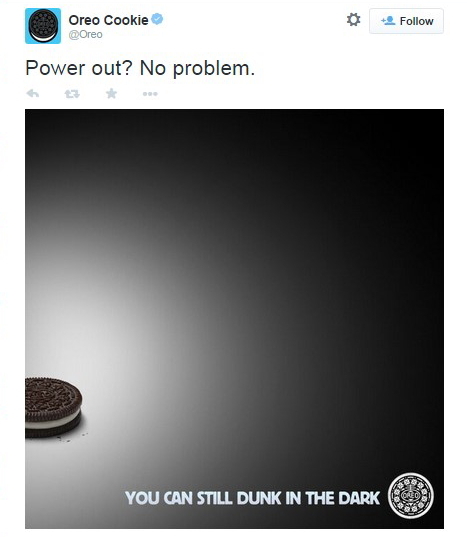 The tweet was arguably more successful than the Oreo commercial itself- simply because it didn’t cost millions of dollars to launch. Newsjacking can be immensely successful when done correctly. It is also relatively cheap to implement; because the news is already created and out there, you simply need to come up with a clever angle and launch that angle in a timely manner. 1. Set up your Google Alerts. Use the Google Alerts tool to notify you whenever there is a significant development in your niche or industry. To do this, first input several topics into the tool. For example, if you sell espresso machines on your website, you could input “espresso,” “espresso machine,” “cappuccino” and even “coffee.” Then, set your alerts to be emailed to you on an as-it-happens basis. Presto, instant news. Input your niche or industry keywords into the Google search tool and see what suggested searches pop up. Doing this will help you decide which stories are generating the highest search volume and therefore which stories you should tackle first. You can do further keyword research via Google’s Keyword Planner; simply create an AdWords account and the Keyword Planner is yours to use, even if you generate no actual AdWords-based ads. 3. Generate timely but correct information. Because you are newsjacking, you need to create and publish your content quickly- otherwise, your content will appear old and dated and not attract much attention. To this end, don’t worry too much about picking out the best photography or finding the perfect sources for quotes. All that truly matters is that your content is accurate. Everything else can be added on at a later (if any) date. 4. Don’t trust secondary sources. When time is of the essence, you might be tempted to scan news reports or social media commentaries and consider that information to be sufficient for your newsjacking needs. Unfortunately, trusting second or third party sources for reliable news is risky. Not only are such sources likely to skew the news to their own advantage, they may even get some details completely wrong. You also rarely, if ever, obtain the entire news story. You should always go to the primary source of the news story before spinning that information on your own blog or website. Primary sources might include police reports, court records, press releases, scholastic publications, etc. Yes, it’s a pain to rifle through references, but this is not the place to be lazy. 5. Don’t capitalize on tragedy. Before you go tweeting about a death, injury or natural disaster, take the time to consider how your business is related to this tragedy. If it isn’t, don’t force the connection. In fact, when your first start newsjacking, you’re better off steering clear of anything that pertains to suffering and death. As noted from the examples above, it’s simply too easy to generate bad PR by capitalizing on tragedy. Understand and accommodate the world of news. When it comes to newsjacking, you have to think like a reporter and follow the latest news closely. This means that, even if you’re on vacation or working on other content, a late-breaking and hot story will have to become priority #1 for you. Likewise, if your content is being tracked by a journalist, you need to be on-the-spot with additional information and references. Don’t procrastinate or be insulted when asked to work on something late at night. That is the reality when you are working in the world of news. This “read” was most informative as I’ve never heard this termed as “news jacking”. I agree with Jeff concerning Buffy’s work, it’s hard to think people are that desperate and heartless. 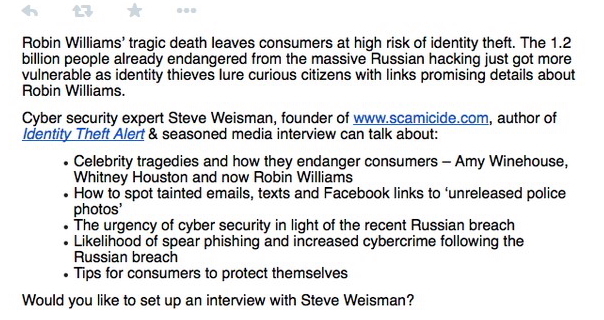 What a great example, for a news jacking “gone bad”…wow. Halina, Thanks for sharing your value, keep up the good work. Great article; however, I was dismayed by the “Coaching Tip” ad from Buffy Filippell of TeamWork Online in which she preyed upon the tragic disappearance of Flight 370 in order to drum up new business. Really? She uses the deaths of 239 people to promote her business? I hope the audience to whom her message was targeted sees her for the unprofessional parasite she is and steers clear of her.